This large male grizzly was certainly one of the most memorable encounters from my recent time in the Great Bear Rainforest. It was clear he dominates this section of river, but his missing ear and torn lip indicate his dominance comes at a cost. With population estimates at one point as high as 50 million, it is hard to believe that in 1902 there were only a couple dozen bison left in the lower 48. 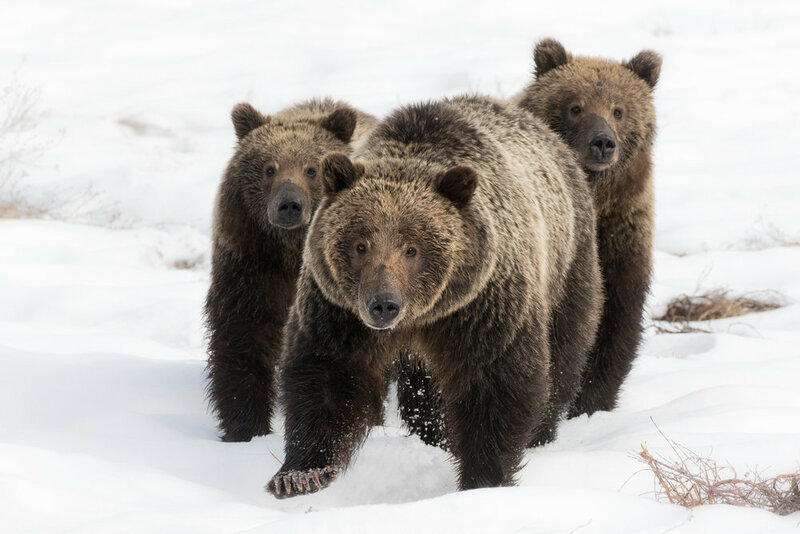 If those few survivors were not protected from poaching in Yellowstone, this iconic species would be missing from the Greater Yellowstone landscape. I caught this large bull, weighing close to 2000 lbs, as he wallowed in the dirt and marked it with his scent. As he shook the dirt off his back the area surrounding him faded into a cloud of dust. Observing and photographing this skilled huntress work the shadows of the forest is always special. This Great Grey Owl may strategically and silently watch her prey for an hour before moving in for the kill. It has been a challenging year for Great Grey Owls in the Tetons. With such a heavy snowfall, and repetitive thawing and freezing cycles, the snow pack was near impenetrable for these skilled hunters. Quite a few succumbed to the harsh conditions and were found dead. The ones that survived, managed to do just barely that, and did not have the strength to nest and raise chicks. On a typical year I spend a lot of my time with these owls. So much so that is easy to take it for granted. My search, going on three months, for just one good Great Grey image has really made me appreciate the time I’ve had with them in the past. After hearing about the appearance of one in the backcountry the other day, I dropped everything to investigate it. It took several hours of hiking, but just as the sun dropped behind the mountains I found the “Phantom of the North” hunting in an aspen grove. My time with her was brief, as darkness was enveloping the forest I still had to trek through to get back to the car, but I was reminded why I spend an inordinate amount of timing searching for just a moment with these birds. When you walk past a pair of fledging Great Grey Owls several times before you even see them, the purpose of their feather coloration becomes obvious. While their temporary inability to fly poses a serious disadvantage, the ability to blend into any perch near seamlessly serves to protect them during their most vulnerable stage of life. If you are fortunate enough to see and photograph a mother grizzly bear like this one in Yellowstone, one of the first things you will notice is her careful attentiveness to her surroundings. Not only will she keep a watchful eye on her immediate environment, but she will also frequently pause to intentionally engage her most powerful sense, her nose. Her sense of smell is estimated to be 1,000x stronger than a humans. To help put that into perspective, a dog, whose sense of smell we use to detect bombs, is estimated to possess a sense of smell that is 70x stronger than a human. Imagine what we could do with a TSA grizzly. With this superpower, a mother grizzly is able to detect potential threats to her cubs from a considerable distance. When she detects danger in the air, her demeanor immediately alters. Standing up tall, she will sniff the air excessively while huffing at her cubs to alert them to the impending threat. Many times I have witnessed this behavior, and within 3o minutes a large male grizzly, which will kill bear cubs, arrives on the scene. Of course by the time I realize what posed the danger, the mother and cubs are long gone. This male dusky grouse chose a stunning stage for his performance to attract a female. Harlequin ducks call home, what most would consider total chaos. These birds thrive in turbulent waters. Every spring Harlequins leave the rough surf of the Pacific Northwest, and migrate to inland to breed among various rapids and whitewater. 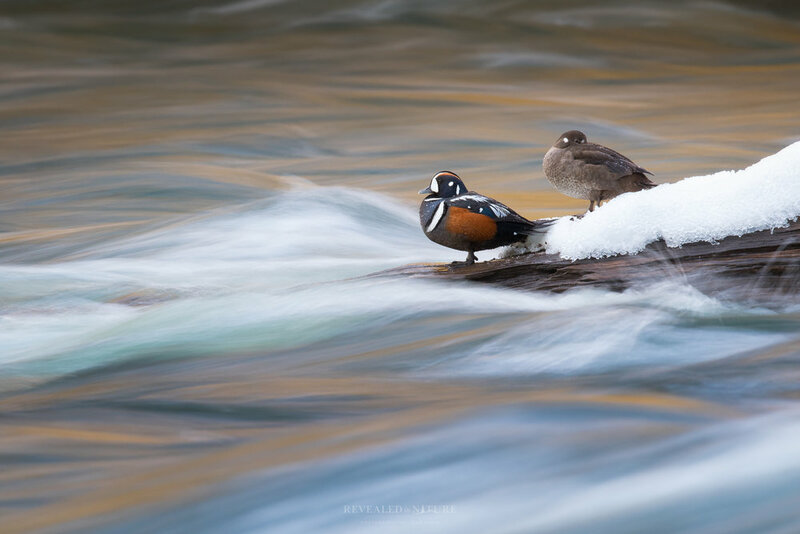 The Lehardy Rapids of the Yellowstone River in Yellowstone National Park are considered the southernmost breeding location for these resilient ducks. Sunsets over the largest high elevation lake in North America never disappoint. Yellowstone Lake, claiming over 140 miles of shoreline, holds ice on its surface over half of the year. It would be natural to assume that all the water is freezing cold, and it would be if it were not for the volcanic forces responsible for shaping this landscape, which are still very active today. While surface is covered in an ice layer as thick as two feet, the water beneath reaches temperatures up to 252° F (122° C)! The male dusky grouse is unquestionably one of the most beautiful birds in the Greater Yellowstone Ecosystem. Unlike many species that winter in lower elevations and lighter snowpack, dusky grouse head to the high country to wait out the winter, where they feed primarily on conifer needles. Hibernation is one of the most remarkable adaptations in nature. Imagine the effects on your body if you were confined to a bed for 5 months, and then imagine you did it without food. That's what this bear just did. Grizzlies are able to rely entirely on fat reserves during this time, and don't deplete any of their muscle mass. Hydrothermal features located throughout Yellowstone provide a visual reminder that the powerful volcanic forces which shaped this unique land are still very active today. Snow melt and rain water permeate below the earth's surface, where it is superheated by an immense magma reservoir, which at places is located only a couple miles beneath the earth’s crust. The water, reaching temperatures above 400ºF, then makes the journey back to the surface, resulting in geysers, hot springs, and thermal runoff. My recent and first trip to Costa Rica was full of unforgettable experiences. The wildlife diversity of the country is astounding. In fact, National Geographic recently labeled the Corcovado National Park the "the most biologically intense place on earth". Naturally, being a first time visitor, I wanted to see as much as I could in the time I had, but there was one species in particular that had captured my imagination, the Quetzal. The male Quetzal, with its green crest, blood red chest, and 3 foot long iridescent tail feathers, looks as if it were a mythical creature. So the prominent role the bird plays in ancient Mayan and Aztec lore is not surprising. According to Mayan legend, a Quetzal was present when the Spanish conquistador, Pedro de Alvarado, killed Tecún Umán, the Mayan hero and warrior. Following the battle, the Quetzal descended and landed upon the dead body of the fallen hero, and his blood stained the bird's chest red. It is said the Quetzal possesses the most beautiful song of any bird in the world, but it quit singing after the Spanish conquest. 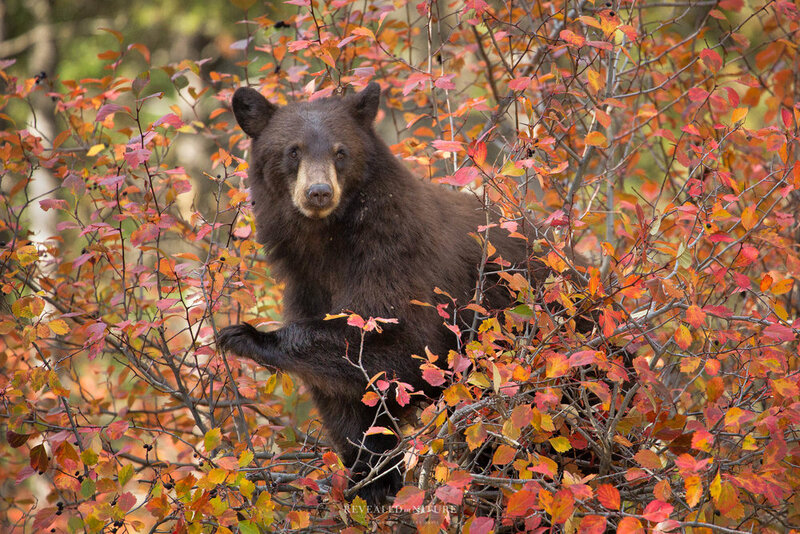 From the Native Americans and early frontier explorers to current day outdoor enthusiasts, perhaps no stories are told with more enthusiasm and pride than those of encounters with the grizzly. This is the emblematic face of the American wilderness. I am so thankful to live in one of the few places this creature still calls home. A rare glimpse of a leucistic Great Grey Owl. This anomaly is caused by a lack of pigmentation. This was the male owl of a nesting pair. I had photograhed the females and two chicks for a couple weeks, but had not seen the male, who was typically off hunting, until this day. Just prior to the taking of this image I witnessed the most unique wildlife event of my life, a black bear and two cubs had attempted to climb the nest tree and eat the chicks. The female let out distress calls which prompted the male to come to the nest site, where they both repeatedly dive-bombed the bears until they retreated. After the whole ordeal, the male was tired and rested on this perch for several minutes. Throughout the year my time is mostly consumed with various photography projects and specific image goals. In these instances I know what subject I am photographing, and even the exact shot I am going for, such as the elk crossing the stream in the fog, or a Great Grey Owl flying in the snow. These images require excessive time scouting in the field to get one shot. I call this style “proactive” photography. In this proactive mindset I envision a scene I want beforehand and then go after it. I may not have control over all the elements, but I use research and knowledge to reduce as many variables as possible, and so increase the chances of making a truly remarkable image. However, this thoughtful approach to photography requires a lot of time, and some days I find myself playing catch up in the office and may only have a couple hours at the end of the day to get out in the field. Plus, there are times I just like to get outside with my camera and see what I can find. There is something about going out to photograph the unknown with an open and creative mindset that is relaxing. On these days, while I may not have a specific subject in mind to photograph, I do have a plan; I listen to the squirrels. Red Squirrels spend the summer and fall months harvesting pine cones and storing them in a cache known as a “Midden”. The Squirrels, being highly territorial and intolerant of any other creature in the vicinity of their middens, and also very small, resort to the best defense they know, an incessantly loud and obnoxious chatter. I realized the relevance of this knowledge for photography last year when I was looking for Great Grey Owls. I had just about thrown in the towel when I heard a squirrel alarm call which led me directly to the owl. Then it dawned on me…squirrels will bark at anything. If I simply wandered the woods following the sound of squirrel chatter I would likely have a higher success rate in locating owls, but I wonder what else I would find? The next day I entered the woods armed with my new tactic. Eyes closed, I stood in silence and listened. No more than a minute had passed and I heard it. The angry squirrel. I followed the sound to the scene where I discovered two squirrels fighting. Entertaining to watch, but not what I was hoping for. A few moments later the sound of another defensive squirrel came ringing through the woods from the east. I arrived at the scene and found the squirrel barking up a storm from its lofty perch in a lodgepole pine, but was clueless as to what set it off. As I spun in another circle scanning the area, the culprit emerged from behind a log. A pine marten! The initially timid weasel was now overcome with curiosity and began to approach me. I stood still until it was comfortable with my presence and resumed the evening hunt. After an hour of tripping over logs trying to keep up with the marten, I decided to put the last hour of light towards finding another angry squirrel. I slowly walked along a stream bank about 300 yards, and heard another alarm call to the south. The call led me to the edge of a small meadow where I found a Great Grey Owl intently focused on a light rustle in the grass.